The outdoors is a passion of mine. I live it. I breathe it. I developed my career around it. As a landscape designer, I have welcomed the opportunity to use the outdoors as a canvas by designing and producing innovative and stunning landscapes in western New York. My artistic talents have enabled me to blend elements of our natural landscape with the man-made components of our everyday world. I strive to keep my ideas fresh, making every project unique. My enjoyment of travel, photography, and sculpture are just some of the ways I continue to enhance my visual repertoire. Of course, I did not arrive at this point in my life overnight. After graduating from Cornell University in 1996 with a Bachelor of Science degree in landscape architecture, I worked for two prominent landscape construction companies as lead designer for eight years. During this period, I was fortunate to work with top professionals in the field, and my skills and creative perspectives blossomed and matured. When, in 2004, I was in the position to venture out on my own, I fulfilled a lifelong dream of starting my own business. With the support of my loving and understanding wife, I literally threw on my work boots, jumped in a pick-up truck, hooked up to a trailer full of tools, and started Firlit Landscape Design Inc.
Today I am proud of my team of eager and experienced employees, who are committed to excellence in every landscape project. 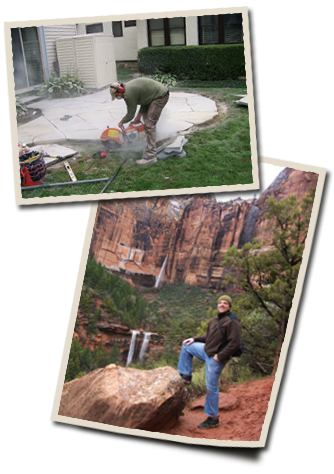 Firlit Landscape Design Inc. is recognized for its exciting approaches and delivery of quality craftsmanship. I personally spend the majority of my time in the field managing and installing the projects that I design. I like to see that no detail is missed from the drafting table to the finished product. Homeowners, builders, developers, and other landscape contractors continue to call on us and benefit from our unique designs and our thorough services. I remain completely invested in my clients and in my work.